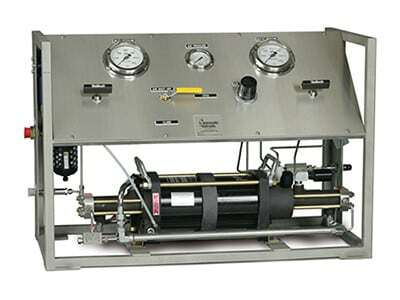 Pneumatic and Hydraulic Company offers a full line of air amplifier systems. Our air amplifier systems feature Haskel air amplifier pumps and are designed to increase air pressure where your plant air pressure is too low. They can be used to operate air tools, pneumatic clamps, cylinders and other pneumatic equipment. Air Amplifiers are most commonly used to provide short-term high flow air, or constant flow with reserve, at a constant regulated output pressure. We can accommodate your air pressure needs up to 5,000 psi. Multiple air amplifiers can even be plumbed in a parallel configuration to meet higher flow requirements when needed. All of our air amplifier packages can be mounted on custom A.S.M.E. receiver tanks to allow for high pressure air storage. All tanks can be fitted with casters to make moving the air amplifier around your shop safe, fast and easy. To make our systems even safer, we include safety devices, such as pilot switches, that shut off the air amplifier when the desired pressure is achieved and prevent over pressurization. Each of our air amplifier systems are equipped with an inlet air filter, an inlet air regulator, an inlet on/off speed control valve, an outlet pressure regulator with a gauge, a relief valve, and come standard with either a 200, 250, or 500 psi tank. Standard tank sizes range from 1 gallon to 30 gallons. Larger tanks are available if required. If your outlet pressure exceeds 200 psi, we offer a range of high pressure regulators that are sized to suit the pressure and flow you need.